If you have yet to walk down Forest City’s Main Street during Christmastime, then you are missing out! Each year, this small town shines with over a million twinkling lights. Read on to learn more about the Forest City Christmas lights and what to expect this year. Afterward, if you are looking for more ways to enjoy the holidays in Western North Carolina, simply download our free Chimney Rock/Lake Lure Vacation Guide. It is full of recommendations on shopping, restaurants, events, entertainment, and more! Access Your Free Chimney Rock Vacation Guide! The Christmas lights in Forest City is a beloved holiday tradition. The event dates back to 1930, and it all started with a few lights hung upon two trees on Main Street. However, the Christmas light displays have come a long way since their humble beginnings. Starting on the night of Thanksgiving, the town is illuminated by millions of sparkling lights. Bring your friends and family, grab a cup of hot cocoa, and enjoy a carriage ride through the magical displays. There’s no better way to get into the holiday spirit! This annual celebration runs until early January. Although you can view the lights in Forest City throughout the winter, the lighting ceremony only comes once a year. This annual celebration kicks off Thursday, November 22, 2018, at 6:00 p.m. Sing along to your favorite Christmas songs and enjoy ice skating beneath a canopy of lights! Don’t forget to warm up afterward with a cup of hot cocoa and cookies at Santa’s house. Forest City Christmas Parade – Bring the whole family for a fun-filled day at the Forest City Christmas Parade. The parade takes place on Sunday, November 25, 2018, at 3:00 p.m. You can look forward to seeing decorated floats, dance teams, and marching bands as they make their way down Main Street. Santa on the Chimney – Did you know that USA Today named Chimney Rock one of the best places to see Santa? Come to this year’s Santa on the Chimney event and see why! You can watch Santa practice his climbing skills as he scales the 315-foot Chimney Rock. The event will feature tons of family-friendly activities, live music, and holiday treats. Plus, you’ll see plenty of local wildlife in Chimney Rock State Park! The 2018 event takes place from Saturday, December 3, through Saturday, December 10. Christmas in Chimney Rock Village – Christmas in Chimney Rock Village is one of our favorite holiday events! You can admire the Christmas decorations, shop at local stores, and dine at a variety of cafes and restaurants. The stores are all open with extended hours for the holidays. There will even be a holiday bake sale! Christmas in Chimney Rock Village kicks off Saturday, December 1, 2018, with the annual Chili Competition and Christmas Tree Lighting Ceremony. Plan Your Holiday Getaway Today! 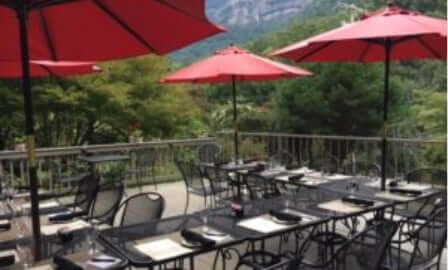 Nestled in one of Western North Carolina’s most incredible canyons, you will find The Esmeralda Inn & Restaurant. 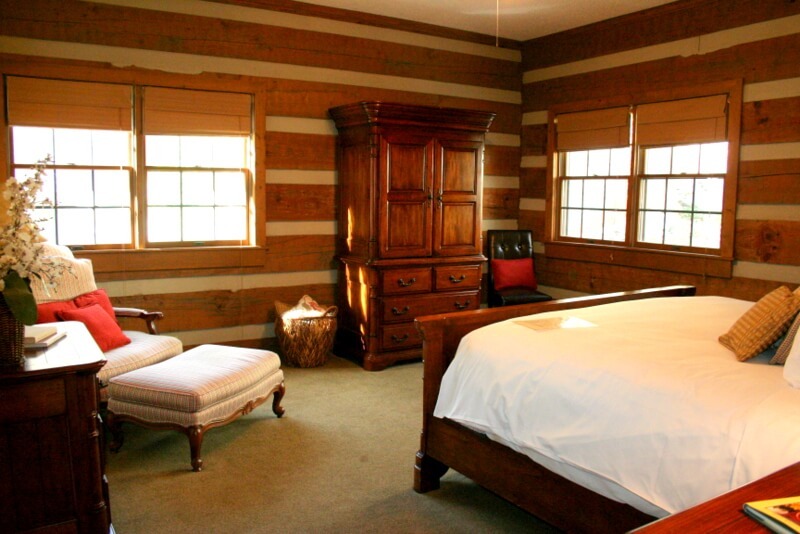 Our picturesque bed and breakfast is only a 45-minute scenic drive away from the Christmas lights in Forest City. 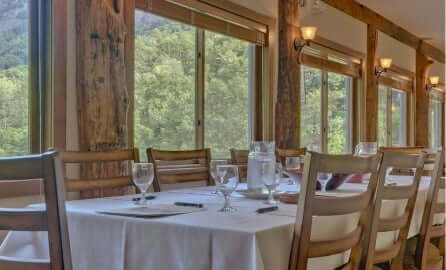 When you book any of our cozy cabins, like The Esmeralda Cabin, you can always look forward to the best amenities, packages, and top-notch service. Our bubbling outdoor hot tub is open year-round and is the best place to relax after a day in winter wonderland! 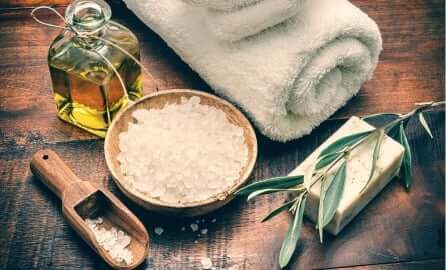 Daily complimentary breakfast, access to The Esmeralda Park, and spa services are a few other perks that our guests can enjoy. 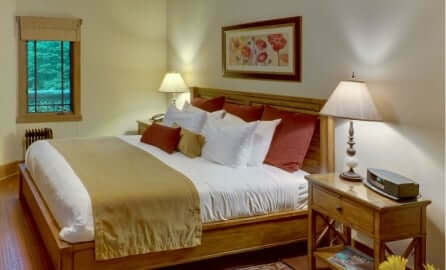 When you are ready to plan your holiday vacation, check our seasonal specials and book your stay. We can’t wait to host you at The Esmeralda Inn & Restaurant! If you are looking for another fun way to spend Christmastime in Western North Carolina, read our blog on Christmas at Biltmore!